Pronounced "Tremors." 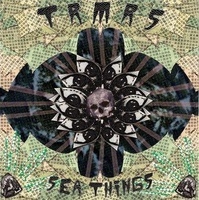 Sea Things is the debut album from these Southern California garage punk rockers. It's obvious that a lot of time and care was put into this record. The cover is a collage of awesome trippy artwork made by singer Tommy Stewart. Sea Things contains 12 tracks of raw, catchy 60's/70's fuzzy surf/pop punk with tons of energy and cool hooks throughout. TRMRS always keep you on your feet, and each song is a bit different. They play music similar to other so cal bands like Audacity, Moonhearts, Cumstain, Cosmonauts, Le Face, etc. Limited to only 600 copies. A must have!